You are currently browsing the category archive for the ‘Yantra’ category. Let my words be like saffron! Having attended a long birth a few nights ago, I’ve come back into daily life where I’m living by the rhythm of the sun again. I’ve been writing today, winding my way through a logical sequence of thoughts and images, moving through a vinyasa of words. Writing is Yoga where the invisible takes shape, where silence becomes sound, where thought becomes vibration. It is a creative act that mirrors the original one of Birth. The sensation of following the thread of my thoughts reminds me of the Greek myth where Ariadne holds onto the end of a ball of thread that her lover, Theseus, unspools as he enters into the heart of a labyrinth. There he meets and kills a half- human beast. The thread guides him back out. He begins and ends his journey in love. On the way, he loses his fear. Giving birth is like this. You go to the centre of what you are. You touch the heart. In fact, there is an ancient yantra (a Tantric symbol of cosmic unity) given to labouring women that is in the exact form of a labyrinth. 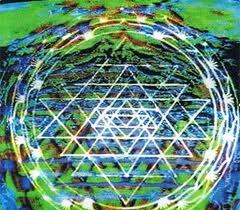 It’s called a Chakra–vyuha but it is identical to labyrinths drawn for thousands of years on the walls and floors of caves, temples and churches worldwide. The pattern is woven into baskets in South America. It is carved into the grassy ground in England. It is built out of stones in Scandinavia. In a Hindu birth ritual a yantra is traced in saffron. The birthing woman mentally walks through the yantra and then the saffron is washed away with water. The water is collected and given to the woman to drink. Her body absorbs the substance of the rhythmic pathways of her mind and she is free to move into the uncharted territory of Life. There is no difference between her and love.